We are delighted that you are going to stay with us! In order to maximize the time you spend relaxing in Niseko, and minimize the time you spend at check-in, we have made the following form available so you can check-in immediately. Please kindly check your arrival and departure date. By Japanese law, we are required to obtain the address and occupation of the lead guest. By Japanese law we are required to collect the names and passport copies of each member of your group - including children and infants. (Exceptions are for Japanese citizens or Japanese residents. In those cases we need guest names and addresses but no passport copies). Please input the full name of all the persons travelling with you (including the ones which may join later during your stay). 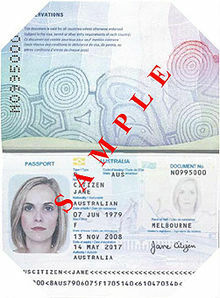 Please take pictures or scan the page which shows the picture and the passport number, as you can see in the example below. You can take pictures with a smartphone - as long as the picture is focused and the characters readable - or use a scanner.